I received a handmade hooded towel as a shower gift when I was pregnant with Elle and didn't realize at the time what a great gift it was. I should have guessed that those thin little hooded towels you pick up at the big box stores aren't absorbent or big enough to actually dry a completely soaked squirming 9 month old. I figured it out pretty quickly though. I love them because it's such a simple idea (have you noticed I like the immediate satisfaction type projects best?! ), they're super useful, and if you use quality towels like I do, they'll be around for years of bath and beach time fun! So here you have it, I'll share the love, a tutorial on how to make these simple hooded towels. 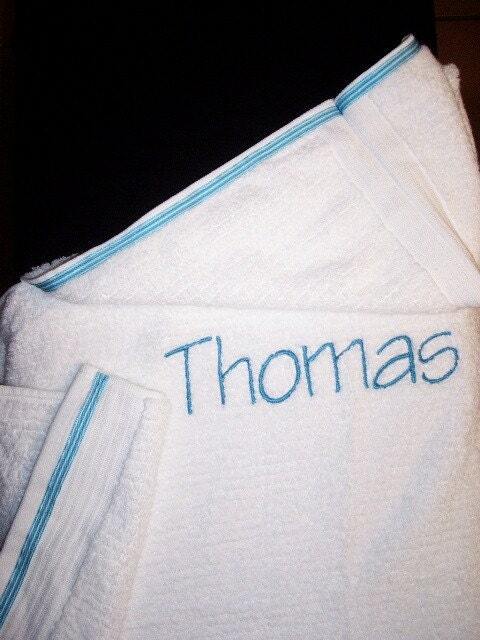 Although if you need an extra special one for a super cute gift or if all your kid's stuff has his/her name emblazoned on it, but you don't have an embroidery machine of your own, I still suggest you buy one of the super fantastic Elle Belle embroidered towels! 1) pick up a nice quality bath towel and wash rag in the same or a coordinating print. 3) sew one of the short ends of the wash rag together. Flip inside out to make the hood. 4) pin the unsewn side of the wash rag to the middle top of the long side of the bath towel (pin it further up the wash rag if you're making the towel for a baby, or closer to the rag's edge if you're making it for a toddler or older child). 5) Sew the hood on and enjoy that cuddly after bath time with your little one even more! The timing worked out so that we could tell our family and friends at Christmas. 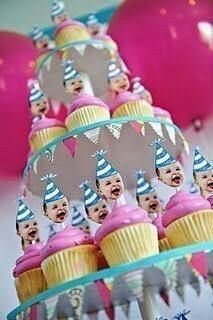 I wanted to think of a cute way to tell Elle because I knew she’d be so excited. The Etsy shop, Ten Finger Workshop, makes adorable little wood people who have been on my Etsy favorites forever and it was the perfect excuse to have a custom set made. 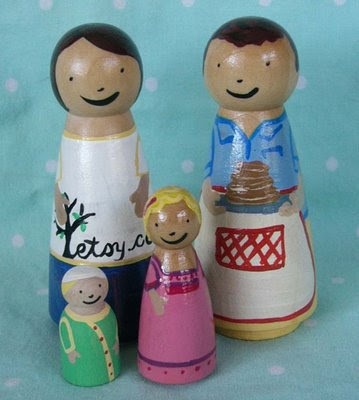 I sent Lily a picture of the three of us and a couple ideas of ways she could paint the family so that they look like us (she painted me in my Etsy shirt, Daddy with a stack of pancakes (he cooks a mean Sunday breakfast! ), Elle with her curls and a bow) and I asked her to add a baby wearing something green. I vividly remember opening the picture Lily sent me of the little family she made for us. I hadn’t really thought about what “we” would look like as a family of 4 instead of 3, it was a fun way to picture our growing family! And then she got up out of my lap and ran into her room to play with a new toy.